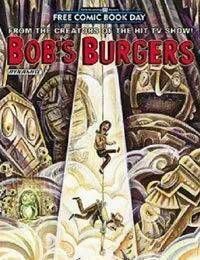 Bobs Burgers, the hit TV show created by Loren Bouchard, is now a comic book! The Belcher family — parents Bob and Linda, and their children Tina, Gene, and Louise — appear in this special Free Comic Book Day edition that collects the Best Of in-canon stories from Dynamites first-ever Bobs Burgers comic book series. Thrill to Tinas “Friend Fiction”, Louises “Unsolved Mysteries and Curious Curiosities”, “Gene Belcher Presents: The Musical”, and more! Its an all-ages extravaganza that captures the feel of Bobs Burgers perfectly — because its a comic 100% created by show writers and animators!